ancc ensures that V\\ be able to open and close the drawers easily, or even withdraw them completely. I often place a drawer on my bench so I have full access to its contents. Top off your workbench with 3 in. of maple. 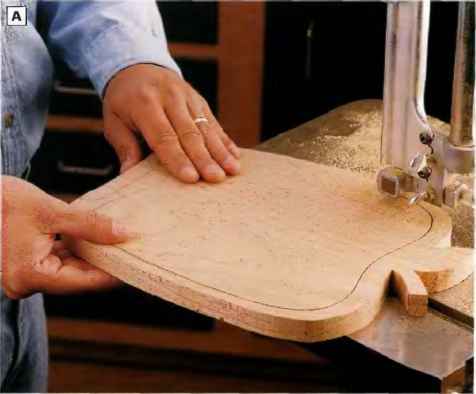 As shown in the drawings, the top will overhang the base on all four sides and give you a solid holding place for clamps. To attach the top, 1 used counter-bored bolts that fasten to captive nuts in four end-assembly legs. Wooden plugs fill the counterbores and the leg holes I drilled for the nuts. I admit that this anchoring method amounts to overkill. ROBERT WHITLEY'S home arid shop is located outside of Philadelphia, PA. For more on his work. see page 76. Clue and screw side to rabbet in front.